Sailorcurt headed home about 6:30am. I headed over to the convention center for a talk w/ Paul Helinksi, the founder of GunsAmerica. He gave a very interesting lecture on how and why he started the company and where he thinks the industry is heading in the future. Ahab and I got into a discussion on Dragunovs before we headed over to the NRA and the Media Forum was being held. Two prominents there were Sandy Froman and Oliver North. They started out with a video on the CNN coverage of our favorite buddy Sheriff Jenne and his 'assault weapon' fallacy. I was surprised by how many people around me expressed surprise at it as I consider it a staple of our evidence. I presented a question as to how many in the audience had never heard of it and about a quarter of the people raised their hands. Even several on the panel expressed their surprise at that. I think this shows that we need to work harder to get the information out there when even long-term members are unaware of things like this. Several other questions were posted before the Truther ambush of Col. North. After talking w/ some fellow gun nuts from Michigan, I headed back to the Media room where I spent the next hour or so waiting for Tam and just generally BS'ing w/ the other bloggers. They left for lunch and I was just getting ready to head out to the floor for one last sweep and get some food of my own when the NRA reps got the phone call about our buddies also hitting up Ted Nugent. I decided to stick around to hear what I could hear. I'm glad I did as I was able to get a side of the incident that most didn't see. Out to the floor I went where I ordered my wife's b-day gift from the NRA store and got some lunch. 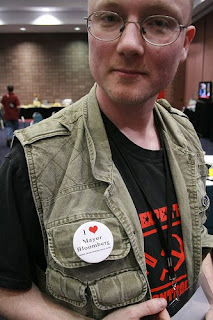 As I sat down at a table, a lady noticed my "I love Mayor Bloomberg" button but not the Lauer Weaponry site below it. She gave me a cool look and told me I was sitting at the wrong table. I laughed, explained what it was about, then spent the next half-hour or so chatting w/ her and her friends from Texas and Idaho. Note to self. Next year, make up cards for the site. That concluded my NRA 2008 convention experience. Once I get things in order, I'll do a roundup of what I thought about the whole deal. Nice to see you managed to dodge all the cross fire on your trip. Did they hand out any wheel barrles full of cash?